Cliff Townhouse, a seafood restaurant in the heart of Dublin city, overlooking St. Stephen’s Green park, Gaiety Theatre and Grafton Street shopping district. This is a popular haunt for Dubliners, serving brilliantly executed Dublin classics, with the head chef Sean Smith, devising menus that focus on sustainable seafood from Irish waters – including Donegal Cod, Dublin Bay Prawns, West Cork Scallops and seasonality is at the core of his approach. 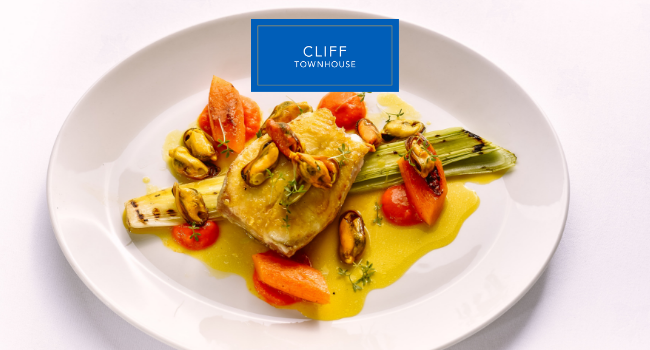 Cliff Townhouse restaurant menus are equally suited to a three-course celebration or a light bite in the middle of the day and staples include Seafood platters, selection of Oysters and Caviar, various market fish and Irish meat. TheTaste and Cliff Townhouse are giving readers the chance to Experience a Three Course Meal with Two glassed of wine at The Cliff Townhouse for Two People for €75. – Voucher is available Monday to Thursday only and excludes all Fridays, Saturdays and Sundays. – Voucher is valid for a 3-course meal and 2 glasses of wine in total, based on 2 people. – Voucher can be used between 17:00 to 19:30 and is subject to availability. – Table reservations are necessary. – Taste.ie voucher number must be provided at the time of the booking. – Vouchers presented on the evening without prior reservation or a mention, will not be accepted. – Items on the menus which require supplement are not included in the promotion. – Voucher must be printed, and any overspend paid directly to the restaurant on the night. – Presentation of the voucher will be required upon arrival. – Voucher is subject to availability. – Limit of 2 vouchers per table. – Multiple vouchers may be purchased for yourself or as a gift. – This offer cannot be combined with any other offer. – Must be over 18 to enjoy this offer.